Arab Americans have selflessly served and bravely sacrificed as members of the U.S. Armed Forces for decades, as evidenced by the Arab American National Museum’s popular original traveling exhibition Patriots & Peacemakers: Arab Americans in Service to Our Country. Today we’re pleased to share news of a military honor typically reserved for U.S. presidents being granted to an Arab American serviceman who made the ultimate sacrifice for his country. His is among the 170 stories told in Patriots & Peacemakers. A U.S. 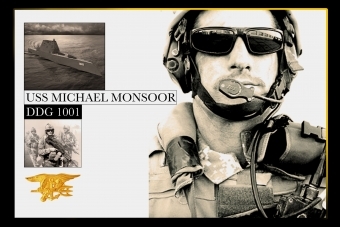 Naval ship under construction and set for commission in 2016 has been named USS Michael Monsoor in memory of Petty Officer Second Class Michael A. Monsoor, a U.S. Navy SEAL and Medal of Honor recipient of Lebanese decent from Garden Grove, Calif. While serving in Ramadi, Iraq, on Sept. 29, 2006, Monsoor was part of a sniper overwatch security position with three other SEALs and eight Iraqi Army soldiers. An insurgent closed in and threw a fragmentation grenade into the overwatch position. The grenade hit Monsoor in the chest before falling to the ground. Positioned next to the single exit, Monsoor was the only one who could have escaped harm. Instead, he dropped onto the grenade to shield the others from the blast. Monsoor died approximately 30 minutes later from wounds sustained from the blast. Because of Petty Officer Monsoor’s actions, he saved the lives of his three teammates and the Iraqi soldiers. Monsoor sacrificed his own life to protect others and was posthumously awarded the Medal of Honor for his heroic actions. 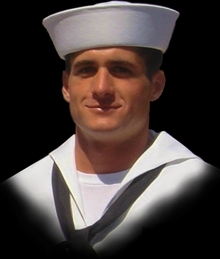 As noted in the Medal of Honor official citation, "by his undaunted courage, fighting spirit, and unwavering devotion to duty in the face of certain death, Petty Officer Monsoor gallantly gave his life for his country, thereby reflecting great credit upon himself and upholding the highest traditions of the United States Naval Service." USS Michael Monsoor will serve as a multi-mission surface combatant tailored for advanced land attack and littoral dominance. The ship’s mission is to provide credible, independent forward presence and deterrence and to operate as an integral part of naval, joint or combined maritime forces. Construction began on the vessel in 2010.The ship will span 610 feet in length, have a beam of 80.7 feet and displace approximately 15,000 tons. It is to be the second ship of the Zumwalt-class of guided missile destroyers.